CSA stands for "Community Supported Agriculture," and is just one of the many ways customers who believe in "real food" can support a farmer. Paying for the share before you receive the produce not only shows your loyalty to our Farm, but enables you to get fresh produce all season long without the hassle of paying each week. As farmers we really love the CSA model because it focuses on the relationship between Farmer and customer; we are committed to bringing you delicious fresh produce and artisan cheese as a thank you for choosing to stand behind our Farm. Salad (April 30-May 21, 2019), Main (May 28-Oct. 8, 2019), and SoloShare (Oct. 15-hard freeze...usually late November). We encourage customers to sign up for all three seasons to enjoy the freshest produce and cheese from early May until Thanksgiving! The simple answer is no. However, at ARNKA Acres our vegetables are grown in an environmentally sustaining manner. It means we use aged animal manure compost and organic fertilizers. Our practices are guided by the National Organic Standards and by our own goals for achieving a sustainable system. We choose organic seeds when available. We control pests through the use of crop rotations and row covers. Some bugs we'll just tolerate! The harvest is brought in from the Field hours before you pick it up--it just doesn't get any fresher! We invite all shareholders and farm visitors to spend a day with us, walk through our fields, and check out our compost--come see for yourself how we farm! We will send out a newsletter via email to keep you informed of special situations, crop updates, recipes, farm happenings, and other items. In addition to the newsletters, we often post updates, photos, and other fun adventures on Facebook. Because Farmer Rachel will be at the Pick-Ups, ready to chat and share life with you, they are also a great place to learn what is going on. After a long winter of eating bland grocery store “fresh” produce, you long for locally grown, delicious veggies. You love having lots of greens on hand for cooking, juicing, or making smoothies and big salads. Local is important to you; you want to know your Farmers and how they grew your food. You want to be one of the first customers to get your hands on ARNKA Cheese. Salad CSA is 4 weeks, starting the last week in April. You receive 4 baskets of salad greens and ARNKA cheese handcrafted by Farmer Rachel. Our goal is to provide members with our earliest spring produce, reminding them of how gratifying it is to eat local veggies. What's included in the shares? The items will vary each week to ensure you don't grow tired of eating the same thing. Greens will include our famous Mixed Salad Greens, leaf lettuce, spinach, arugula, kale, and tatsoi. Possible salad mix-ins are radishes, turnips, carrots, eggs, and green onions. The ARNKA cheeses can be grated to top your salad, sliced and melted for a sandwich, or even eaten plain (we promise not to tell if you do). Too busy to come to the Farm? We offer a Drop Off option for NO ADDITIONAL COST. Drop Offs are currently available in Dike on Wednesday afternoons and Grundy Center and Reinbeck on Thursday afternoons. A 2019 Salad Share costs $55 (only $13.75/week). A deposit of $25 is required to reserve your spot with the remainder due April 1, 2019. Fill out the online registration. 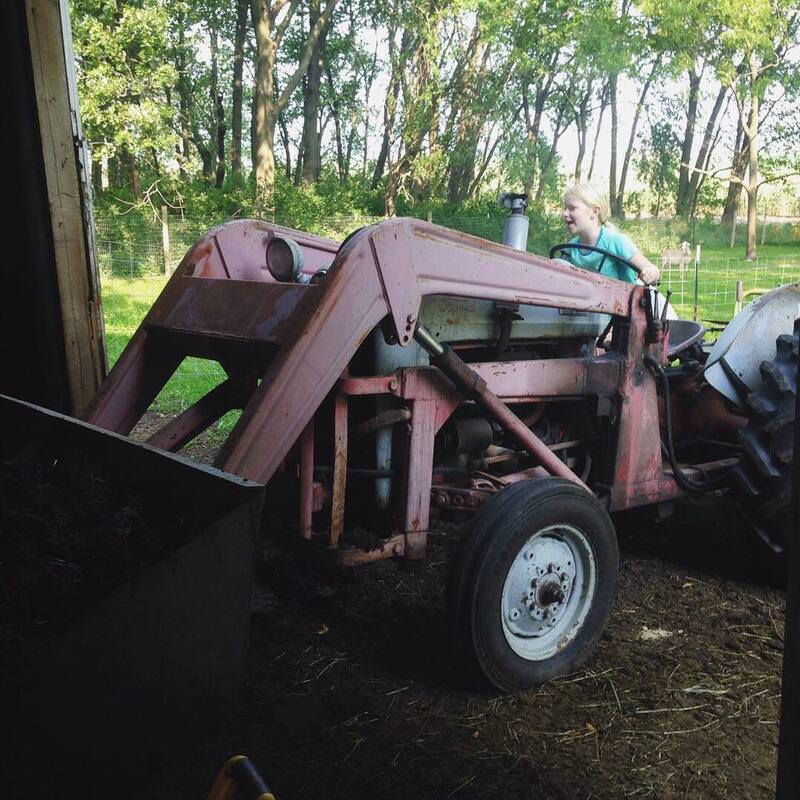 How is ARNKA Acres Different than a traditional CSA? There are two main differences that set ARNKA Acres apart from other CSA's. We offer a true Customizable Market-Style Pick Up. When you get to the Pick Up, you will grab a basket based on the share size purchased. Then you can fill your basket with whatever items you'd like. You may take some of everything or you may pass on some items and take more of others. For example, let's say you don't like beets, but you really like carrots. You may leave the beets and fill half (or all) of your basket with carrots. Throughout the season, there may be limits on an item such as the first time a crop appears on the CSA table. Our hope is that every member will leave the Pick Up with a basketful of items they are excited to eat. 2. Difference #2 is what is in the shares. While the majority of the baskets will be filled with our freshest produce, we will also include, AT NO EXTRA COST, free-range chicken eggs and cow and goat cheeses made by Farmer Rachel. This ensures the members will receive a full basket even if Mother Nature doesn't allow for optimal crop harvests! Just as much as we are about fresh food, ARNKA Acres is also about the farm community experience. CSA members can come to the farm each week to gather their baskets, feed the goats, pet the cats, or relax in the hammock. Many of our members grab a seat, chat with other members, and watch their kids play at the playground. Come join us! 20 weeks long, starting late-May through the beginning of October. Each member will receive 20 (10 for 1/2 Shares) baskets full of fresh produce and ARNKA cheese. Our goal is to have abundant shares each week with a great deal of variety and to surpass your expectations. We ask that you choose the option that works best for you as you will need to keep that choice throughout the season. We will offer a "Market style" Pick-Up: We set up the produce as if we were at a farmers' market to allow you to fill your basket with the items you want and pass on the ones you don't. This allows you to pass on produce you know you are not fond of and choose something that interests you. Although we do encourage you to try new vegetables; they just may end up being a favorite! We have 3 different Market style Pick-Up choices. Full shares MUST be picked up be at our farm on Tuesdays (3:30-6PM). Half shares are available at McKenna Pro Imaging in Waterloo every other Wednesdays (4-5:30PM). The Drop Off option works a bit differently. Instead of coming to get your share, we bring it to you at NO additional charge! Cedar Falls every other Wednesday afternoon. If choosing this option, please include your address on the contract. Before the season starts, we give you the option to fill out a form letting us know which are your favorite and least favorite vegetables. We do our best to fill your shares based on your preferences. What's in a typical basket? There will be both produce, cheese, and eggs in your basket. The produce includes a wide variety of seasonal items. We grow over 40 types of vegetables and almost 100 different varieties! A 2019 Share costs $420. A 2019 1/2 Share costs $230. A deposit of $25 is required to reserve your spot with the remainder due on April 1, 2019.